Genetically modified (GM) plants that use Bt (Bacillus thuringiensis), a common soil bacterium, to kill pests won't harm the pests' natural enemies, according to new research by Cornell entomologists. That is welcome news for ecologists and farmers in the debate over GM plants. Much of the debate surrounding the use of GM crops focuses on their effect on organisms that aren't pests. 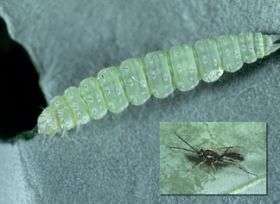 The research showed that GM plants expressing Bt insecticidal proteins are not toxic to a parasite that lives inside the caterpillar of the diamondback moth, a devastating worldwide vegetable pest. It was published in the May 27 issue of the online scientific journal PLoS One. "The conservation of parasites is important for enhancing natural biocontrol that will help suppress pest populations as well as reduce the potential for the pest insects to develop resistance to the Bt," explained Anthony Shelton, Cornell professor of entomology at the New York State Agricultural Experiment Station in Geneva, N.Y., who conducted the study with postdoctoral associate Mao Chen. "Our studies make it clear that Bt plants are a win-win situation to control pest insects and to enhance biocontrol and biodiversity." The Bt bacterium, which is not harmful to humans, has been used for decades as a leaf spray and since 1996, in GM plants, a method that has proven much more effective and is now more widely used. Both uses are approved by the U.S. Environmental Protection Agency. In 2007, Bt corn and cotton plants were grown in 22 countries on 104 million acres, according to Shelton. "Few studies have examined the effect of Bt plants on parasites of caterpillars, but some of them have reported negative impacts," said Chen, noting that the new research suggests that those negative findings were likely due to testing methods. To separate out the effect of insecticides and Bt proteins on the caterpillar and parasite, the Cornell researchers isolated and bred strains of caterpillars that were resistant to Bt or a conventional or organic insecticide. Then the caterpillars were parasitized with a wasp that kills the caterpillar in nature. The resistant caterpillars were then either fed GM plants expressing the Bt protein or non-GM plants sprayed with the Bt protein, conventional insecticides or organic insecticides. The parasitized caterpillars that ate plants treated with conventional and organic insecticides to which they were resistant, survived and developed into moths because the parasite was killed by the insecticide the caterpillar ingested. However, when the caterpillar fed on the Bt-sprayed plants or Bt plants, the parasite was not affected and killed its host caterpillar when it emerged as an adult wasp, showing that Bt plants are not toxic to the parasite. Other Cornell researchers involved in the study include Elizabeth Earle and Jun Cao from the Department of Plant Breeding and Genetics and Jian-Zhou Zhao and Hilda Collins from the Department of Entomology. The work was supported by a grant from the USAID Program for Biosafety Systems.